In front of a packed audience, 20 year old Kurdish beauty from Kirkuk, Shaymaa Qasim Abdulrahman, was crowned MISS IRAQ 2015 at the Sheraton Grand Ishtar Hotel in Baghdad on 19th December 2015. The national beauty pageant was televised for the first time ever in Iraq on Al-Mada TV with a delayed broadcast on 24th December. Shaymaa, who edged out 9 other beauties for the national title, is an undergraduate student of economics and management at a private college in the northern oil rich city of Kirkuk which is located in the governorate of the same name under partial occupation by ISIS since last year. Farah Naseer Haddad, an 18 year-old student at British Institute from Baghdad, was declared the first runner-up (or Iraq's Maiden of Beauty) while 22 year-old stylist and software engineering student Suzan Amer from Sulaymaniyah in Iraqi Kurdistan won the second runner-up position (or Mesopotamian Princess). 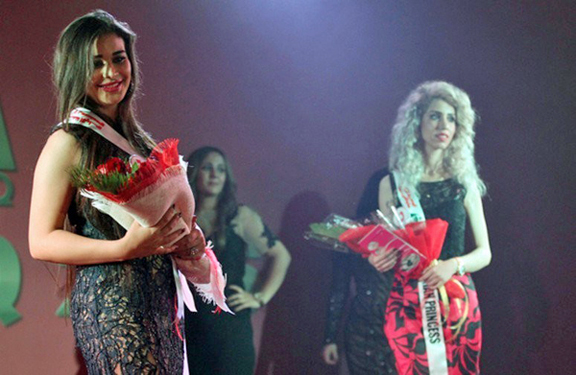 Rania Faisal of Baghdad won the special award of Miss Al-Mada. The event marked the return of Iraq's national beauty pageant for the first time since 1972 when it was last organized under a different title "Hasna'a Al-Iraq / Belle of Iraq" won by Wijdan Burhan who became the first Iraqi woman to represent the nation in Miss Universe 1972 pageant in Puerto Rico. Shaymaa not only earned the distinction of becoming the first woman to be crowned Miss Iraq but also the first Kurdish woman to hold Iraq's national beauty title. The broadcast of the grand finale was hosted by Mohammed Sabah and Manal Al-Motasm, host of morning show on Al-Mada, with backstage reporting by Ameer Alhasoon. The event featured performances from notable Iraqi singers - Ahmed Alhlaq, Haneen Haddad and Omar Khalid. Among the audience sat dignitaries from foreign embassies and representatives from Iraq's Ministry of Culture, Tourism & Antiquities including Iraqi House of Fashion. The panel of judges consisted of Senan Kamel (designer and organizer of Baghdad Fashion Show), Muhannad Al-Dulaimi (former deputy Minister of Culture of Iraq), Alaa Hussein (famous Iraqi actress), Ghanem Hameed (artist and director at National Theater of Iraq), Marwa Zeidan (beautician and owner of AVON Center) and finally, Ghada Al-Alamy (President of the Al-Mada Foundation for Media, Arts & Culture) who crowned the new Miss Iraq. The three hour national telecast featured pre-recorded activities which included castings in Erbil and Baghdad, visit to the ancient archaeological site of the Gardens of Babylon and Ishtar Gate near Hilla and an IDP camp in Baghdad. The finalists paraded in the official uniform during introduction, cocktail dresses for project presentation and evening gowns during the final Q&A by judges. The ceremony concluded with Ghada Al-Alamy, President of the Al-Mada Foundation for Media, Arts & Culture, crowning the new Miss Iraq. The Miss Iraq 2015 pageant was presented by Al-Mada TV & Foundation for Media, Arts & Culture, Inanna Group, Qasr Al-Rawan Travel, FARMASI Cosmetics, Devine Fashion, Cristal Hospitality and Studio180. The Miss Iraq Organization, founded by Inanna Group, is an initiative of young Iraqi civil activists based in Baghdad. The organization owns the official rights to “MISS IRAQ” and “MR. IRAQ” events registered under no. 301/th & 302/th at the National Center of Copyrights and Related Rights under the Ministry of Culture, Tourism and Antiquities of the Republic of Iraq.